I have been trying to write this post for about a month and not being very successful at it. Well it has been a busy month. Still, I just need to do it. Because it felt like I needed to write this post before doing any other post, so.... I have been stymied. At the end of April, I went to Sweden with my sisters. We had thought about doing a trip every year one of us turn 40, and then when we saw a sweet deal on flights to Stockholm.... well we decided we had to do it. So we left all our kids in the capable hands of their fathers and took off. This is all of us during our layover in Iceland. Partially asleep or slightly hysterical from lack of sleep. It was a hoot. To get the whole low down, visit my other blog and wade through all my Sweden posts. Here is the first one if you would like to know where to start. The thing about Sweden is, they do children's literature right. 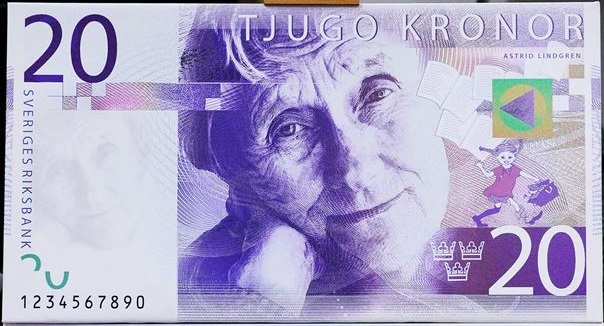 This is Astrid Lindgren and Pippi on the 20 Kronor note. Of COURSE one of the most famouse children's literature authors is worthy of a place on money. Other countries are just slow to see that. They also have a children's museum for Astrid Lindgren in Stockholm called Junibacken. Since we didn't have kids with us, we didn't do the whole museum part, but we did go to the gift shop. Because it is a children's bookshop, so.... duh. There were loads of different authors and lots of great books. Unfortunately, they were mostly in Swedish, which I cannot read, but still... so cool! Some were familiar, some I had never seen before. The Swedish books I DID buy at Junibacken. Aren't those little troll people great? I decided I could probably figure out what these books were saying. And, they are Elsa Beskov. What other reason do you need? See? I can do a counting book. This is my sister, Tori in front of a lovely, bright wall at Junibacken. After Junibacken, we headed to the Stockholm Public Library. The sky was stormy, which made the orange of the outside ever so dramatic. I really don't know why American buildings are so limited in color choices. Me being a nerd and having my picture taken inside. My entourage patiently (or not so patiently) waiting for me and Tori to stop geeking out and come down so we could continue on our way. We had to visit the children's section. This terrifically long yarn caterpillar greeted us and reassured everyone that it was most worth our while to hang out in the kids section for awhile. I love seeing how other libraries arrange things!! Lindsey checking her watch and mentally tapping her foot about needing to get going. As we were getting ready to go into the children's section, I noticed a bin for book recycling. Being curious, I peeked in and saw some lovely red spines. I couldn't leave them there to be turned into pulp!! So I bravely and single handedly saved them from a fate worse than death. I now really need to learn Swedish to justify carrying home twelve books I can't read. Bringing things home became complicated. I saw this tiny doll cradle for about $5 or $6 (50 SEK) and had to bring it home. Then I found these lovely red clogs for only $30. And as a librarian, I wear clogs practically everyday. It is one of the perks of the job. So completely necessary. However the mammoth efforts of packing and repacking to make it all fit were worth it, since Elsie has decided this cradle is just right for her doll. There were book stores we stopped at too. This book was full of gorgeous pictures of rural farm life. We decided to not buy it because we would have to schlep it home and... Amazon! Unfortunately, you can't get it in Amazon or English. One of the little thrift stores we stopped at had this rack of tiny books. SO CUTE. Then we popped up to Uppsala to 2018's Best English Bookstore in the World. We spent an hour or two poking around. This is my sister Clover being pleased as punch at being at this store. If I understood what goes into Best Bookstore in the World, I would tell you all about it. However, this bookstore had books I wanted EVERYWHERE. And fun, quirky, booky gifts. This book is about the words disappearing from children's vocabulary due to a lack of interaction with the natural world. Definitely a book more for nostalgic adults, but still, a book I want to see. Isn't the dandelion page lovely? As we continued to wander through Uppsala, we came across a second hand book sale in the street. I wanted them all, but again, Swedish. I really need to learn it. So many Astrid Lindgren books were never translated to English. Which is a travesty. SO MANY PICTURES. Believe me, I have more. Just you wait for it. This is a great post! That public library is REALLY SOMETHING!!!!! Beautiful! And the tiny books at the bookstore- what's there NOT to love about a tiny book? I don't understand why my students don't grab the limited selection of tiny books off the bookshelf. Sigh.